Happy First Day of Spring! Start Your Spring Cleaning By Bringing In Your Blankets & Comforters! Happy 1st day of spring! Spring is a great time to get your house cleaned and organized. One of the best places to start is with blankets & comforters that can collect dust, oils, pet hair, skin, bacteria, & even microscopic insects that can worsen your allergies – GROSS! Washing bedding weekly is recommended, but if it has been a while, spring is a good reminder to freshen up all of the comforters & blankets in your house. 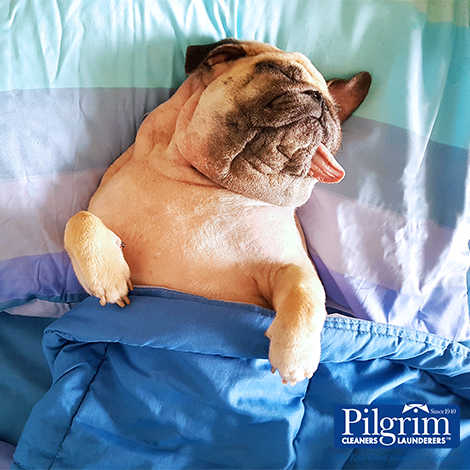 We can help clean your bedding, simply bring it into any of our 27 Pilgrim Dry Cleaners locations or try our free home pickup & delivery service by signing up with our PilgrimGO mobile app! Watch Our Video To See How The 24/7 Kiosk Works! more convenient way to dry clean.